Yesterday we had the Marketing Director of Majestic Dixon Jones sit down with us to talk about advanced link clean up and how you can really get your link profile in tip-top shape using tools like Majestic and Link Detox. Dixon touched on Majestic’s tools and how you can really take advantage of the data to get a clearer understanding of which links you need to remove and which ones you should keep. You can easily identify the links you need to remove using the Majestic set of tools alone. And since cleaning up your link portfolio is a time-consuming task, he also showed us some ways to efficiently use Majestic. Usually, it’s bad news when Google updates their algorithms because it impacts specific niches and we can see a lot of case studies coming out on sites that went down. But since this is mostly a refresh, we’re seeing stable results, improvement or just minor shifts. 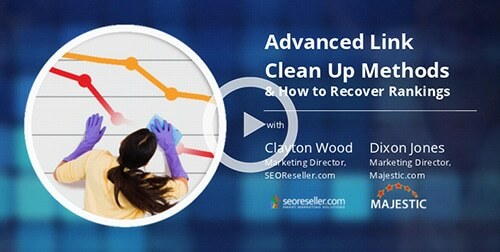 More people are looking for ways to clean up their backlinks now more than ever. Why? Because this refresh will give those who were hit by the previous Penguin updates a chance to redeem themselves.